This beautifully minimalistic antique Chinese rug is characterized by its traditional ivory and blue pallet, as well as its incorporation of traditional Chinese elements of design. 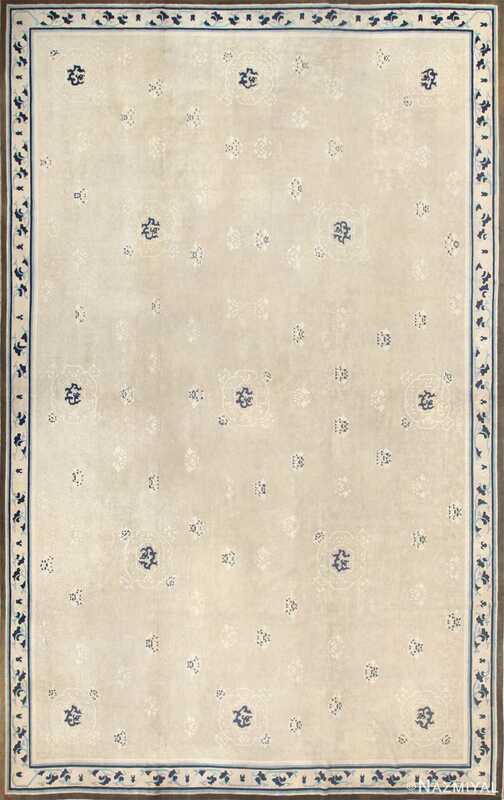 Antique Chinese Carpet, Origin: China, Circa: Early 20th Century - Here is a charming and beautifully composed antique Oriental rug - an antique Chinese rug featuring a lovely and exemplary minimalistic design. Antique Chinese rugs such as this piece, made during the early decades of the twentieth century, are admired for their typically "Eastern" qualities, which emphasize balance, minimalism, and a profound understatedness. 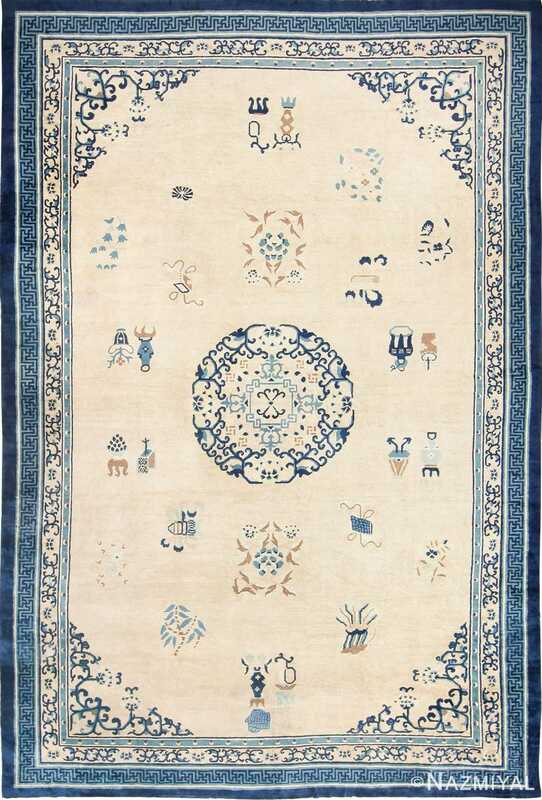 The color pallet on display in this particular piece is especially typical of rugs produced in China at this time: a heavy emphasis on ivory, with detail work rendered in varying shades of ivory and shades of blue. The classical layout of this antique carpet is also highly desirable and representative of the style, featuring a central medallion of sinuous, curving lines. Scattered throughout the large ivory field, which consists primarily of negative space, are a series of small floral details, as well as vases, bamboo trees, kites, and other traditionally Chinese images. 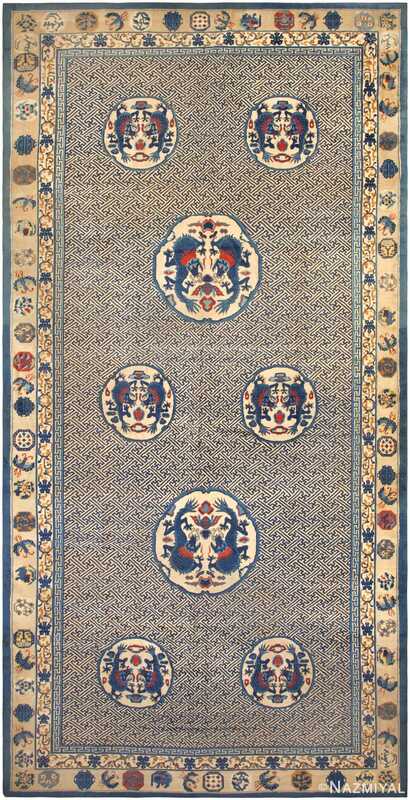 Elegant blue corner pieces that complement the central medallion serve to frame the field. Meanwhile, the entire piece is framed by a beautiful series of blue borders, each wonderfully detailed and intriguingly contrasting with the minimalism of the field. Woven in the early 20th century, this dramatic antique Chinese dragon rug depicts a stunning double-medallion composition adorned with auspicious ornaments. 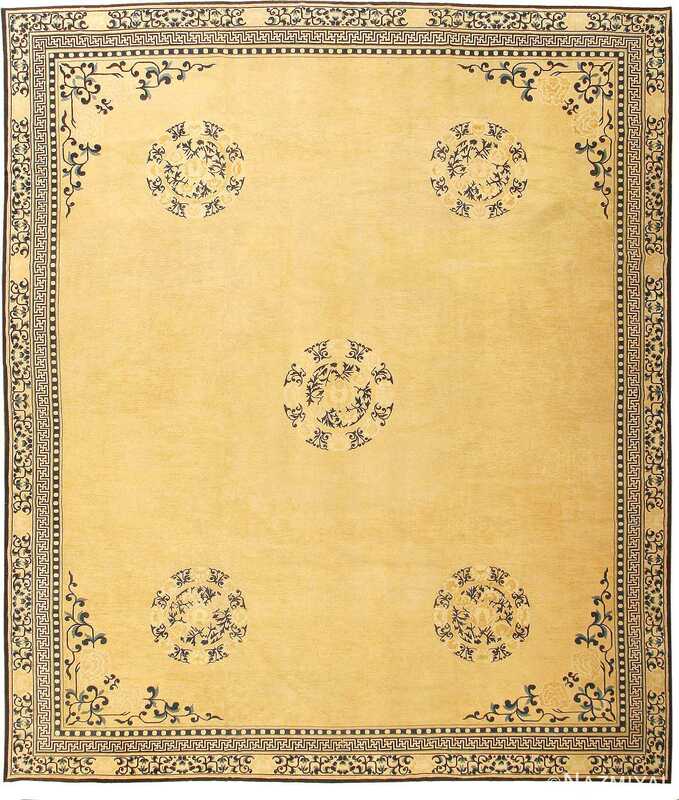 Delicate, transparent medallions and cornerpieces float elegantly on the field of this lovely antique Chinese rug.